Exporter of a wide range of products which include upvc pipes, cpvc pipes and cpvc pipe fittings. uPVC pipes are manufactured at state-of-the-art manufacturing plant. They are ideal for agriculture, industries, construction and domestic applications. 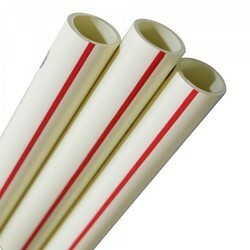 Years of experience in PVC processing at We ensure total quality of the products and satisfaction to the users. Pipes are produced out of extrusion process while injection moulded as well as fabricated fittings are available, under international ISO 9001:2008 process standards, with most sophisticated systems for quality assurance. cPVC Hot and Cold Water Plumbing System is an attractive alternative to conventional plumbing system made of G.I. and copper pipes. Hot and Cold Water Plumbing system uses pipes and fittings made of technically advanced plastic material. 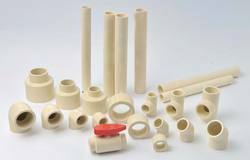 These pipes and fittings are produced from a specialty blend of Chlorinated Polyvinyl Chloride (CPVC) material with unique physical properties desirable for Hot and Cold Water applications. cPVC pipes and fittings are manufactured in sizes 1/2" to 2" Copper Tube Size (CTS) dimensions, in accordance with ASTM D - 2846 specifications. Our expertise in PVC Processing helps produce highest quality CPVC pipes and fittings with latest technology and equipments for CPVC processing. As always, we provide unmatched combination of Trust Quality to our customers.